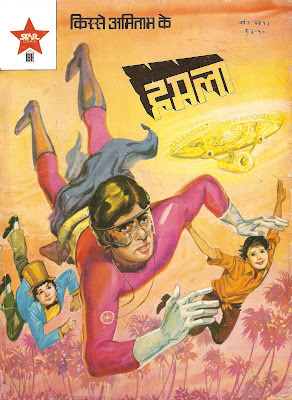 Kranti is a 1981 Indian Hindi film. Produced and directed by Manoj Kumar it also stars Manoj Kumar along with a very large cast consisting of Dilip Kumar, Shashi Kapoor, Hema Malini, Shatrughan Sinha, Parveen Babi, Sarika, Prem Chopra, Madan Puri and Paintlal. The story was written by Javed Akhtar. The film marked the return of Dilip Kumar to films after a five year hiatus. ROI Movie was sold for around 60 Lakhs per territory for seven territories. Leads to All India cost of 4.2 Crore. Recovery was approx. 5.75 Crore DS from domestic theatrical run giving around 1.55 Crore profits from theatrical business only. Recovery 5.75 Crore Domestic Distribution Share against 4.2 Crore cost. (8 Crore NETT). Relative performance Good compared to biggest Hit of year Naseeb , Lawaris and excellent compared to other hits like Love Story, Yarana, Ek Duje Ke Liye. Recall value Good, It was huge multistarrer and always remember fot its excellent music by LaxmiKant PyaareLaal and royal setup. BollyBusiness Note It was Golden Jubilee HIT, entailed good profits for all India distributors despite heavy price tag (4.2 Crore) attached. It was costliest movie ever at that time(Naseeb was even more costlier came later in same year). ~ by Yakuza on March 23, 2010. Excellent superb. I love reading these segments. Please create a separate section on this website for segments like this, it truly deserve it. Just wondering, Kranti, Laawaris, Ek Duje Ke Liye, Naseeb, Meri Awaaz Suno, and Love Story were the biggest Hits of 1981 (no doubt 1981 was a great year). But what was the biggest hit of 1981? I personally think it was Ek Duje Ke Liye as it was very low budget and had a huge ROI? good work Yakuza,can u will do of film Naseeb.